Architect and author Fran Leadon gives a mile-by-mile grand tour of New York's most storied street in the book Broadway: A History of New York City in Thirteen Miles. Leadon reveals the street's deep connections to the history of the city and the nation, and brings back to vivid life a colorful cast of Broadway heroes and villains who helped invent American popular culture. Dutch colonists established the Brede Wegh, Dutch for Broad Way, some time between 1625 and 1640. Originally around a half a mile in length, Broadway gradually expanded to the north to become the city's primary artery and engine of its economy. Leadon looks at the massive fires, dramatic booms and busts, immigration, class and race conflicts, architecture, and street culture that combines to shape the Broadway we know today. There are also stories about many legendary New York landmarks, such as Union Square, the Flatiron Building, Lincoln Center, Columbia University, Trinity Church, and classic department stores Lord & Taylor, Stewart's, and Constable's. Leadon introduces readers to the creators of Broadway who also altered American culture, starting with Alexander Hamilton, whose retreat, the Grange, was located in the then-rural north of the city and whose final resting place can be seen from Broadway in the graveyard of Trinity Church. There's also P.T. Barnum, whose American Museum was on Broadway; Edgar Allen Poe, who edited the ill-fated Broadway Journal and wrote his immortal "The Raven" at a farmhouse off Broadway; George M. Cohan, a song-and-dance man turned producer who added countless classics to the American songbook, including "Over There," "You're a Grand Old Flag," and Give My Regards to Broadway," but he also helped cement the legend and mystique of the "Great White Way" in the American imagination; and John James Audubon, who hated cities but lived in isolated splendor in what is today Washington Heights. Leadon also looks at lesser-known, but no less important or colorful characters, including William Poole, a brutal nativist and prizefighter; Henry Brevoort, a farmer who supposedly caused Broadway to "bend" at Tenth Street; and Charles Francis Brush, who beat Thomas Edison in the competition to light up Broadway with electricity for the first time. Walt Whitman, whose Leaves of Grass was influenced by Broadway's raucous noise and traffic, wrote, "Broadway will never fail in riches, arts, men, women, histories, stately shows, morals, warnings, wrecks, triumphs - the profoundest indices of mortality and immortality." 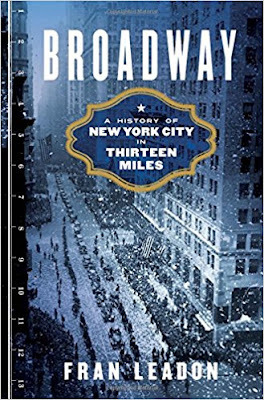 In Broadway, Leadon creates a multilayered narrative of how modern cities develop and evolve, making this an insightful new resource for the expert and a treat for any reader curious about the true stories behind the legend of Broadway. 1. You previously co-wrote the fifth edition of the AIA Guide to New York City. How did your love of architecture influence the way you approached writing about the history of Broadway? Leadon: Actually, it started as a book about architecture but evolved into so much more, because I got interested in the stories of all the remarkable people who lived and worked there. 2. Why did you decide to focus your book on this one remarkable street? The AIA Guide was about every street in the city, so I thought it'd be interesting to focus on just one. Broadway was the obvious choice. 3. Who were some of the key figures, and what are some of the early events and landmarks, that helped shape Broadway and make it what it is today? Broadway figures prominently in the careers of so many people, and in so many key events in American history, it's hard to pick, but let's start with P.T. Barnum, Alexander Hamilton, Edgar Allan Poe, Emma Goldman, Edith Wharton, John Jacob Astor, John James Audubon, Babe Ruth, and Walt Whitman; the Revolutionary War and Civil War, the invention of the ticker-tape parade, and growth of popular culture in theater, music, dance, art, and architecture, and the first home of the New York Yankees. And there are more important landmarks along Broadway than any other street in America: The Flatiron Building, the Ansonia Hotel, Trinity Church, St. Paul's Chapel, Columbia University, the Woolworth Buildingn, Times Square, Herald Square, and Union Square, to name just a few. 4. Union Square interrupts Broadway's path for three blocks, and has a rich, often forgotten history as a place of protests and rallies. What is it about this park that made it a stage for protest? In the mid-nineteenth century Union Square was still in the center of town, and so it was a convenient place to hold large-scale rallies, including the epic 1861 "Great Union Meeting" that cemented the North's unity against secession at the beginning of the Civil War. It was redesigned in the 1870s the accommodate larger crowds, and by the 1880s was used on a daily basis as a gathering place for labor organizers. Then came rallies and protests involving Socialists, anarchists, suffragettes, and, by the 1930s, Communists. Only occasionally is Union Square used for that purpose today. 5. Why doesn't Broadway follow the straight paths of other New York City avenues? Broadway predates the avenues, which were all laid out in the nineteenth century as part of the 1811 Commissioners Plan. Broadway is much older, and the section that cuts at an angle across the avenues was originally part of the Bloomingdale Road, first laid out in 1703, which was a rural highway and didn't follow a straight line. 6. Why has Broadway become synonymous with theater? The first true theater district in the city grew up around City Hall Park. Gradually, it expanded north along Broadway as the city grew to the north, ultimately reaching Columbus Circle. But Times Square had the most theaters, most of them the product of an unprecedented building boom precipitated by the opening of the subway in 1904. 7. But why did Broadway attract so many theaters? Why not Fifth Avenue or another thoroughfare? For years the Bowery vied with Broadway as the city's main street for theater. But Broadway attracted the big hotels and restaurants necessary to support more and more theaters, while the shorter Bowery gradually faded from the scene. 8. You write about how the west side of the street was once the fashionable "dollar side" and the east the cheaper, less desirable "shilling side." Is this cultural divide still present today? That distinction disappeared as the street gradually expanded to the north, although a version reappeared fifty or so years ago in Washington Heights, when Broadway became a dividing line between the predominantly Dominican neighborhood east of the street and the neighborhood to the west, which was wealthier and had a higher concentration of Jewish residents.